Don’t you wish occasionally that you could just plant something and walk away? Never have to prune, water, feed, deadhead, divide, or replace when it turns up its toes? Then maybe I have an idea for you. What if I told you you could just about have it all? Year-long color and zero maintenance. Never have to reach for your snips because your garden addition would always be exactly what you put in the ground. I’d like to show you some ideas for additions to your garden that will last and last. We all want people to enjoy themselves when they come to our home. How does that enjoyment come about? We serve good food, encourage hearty conversation, give our guests an experience they wouldn’t necessarily have at home. The best get-togethers entail a certain magic, don’t they? Your job as host is to attend to the details, so the magic can take place. And no detail should be beneath you. I suggest you prioritize, maybe make lists, but then stand back and look around. Is each room, each corner, each setting, done up in expectation that your guests can make themselves comfortable and delight in their surroundings? Have you anticipated and provided everything you think they’ll want? Once you’ve attended to the big stuff, it’s time to pay attention to even the smallest of details. Sit a spell. Many of us entertain around the pool during the warm months. People love to be near the water, even if they aren’t taking a plunge. 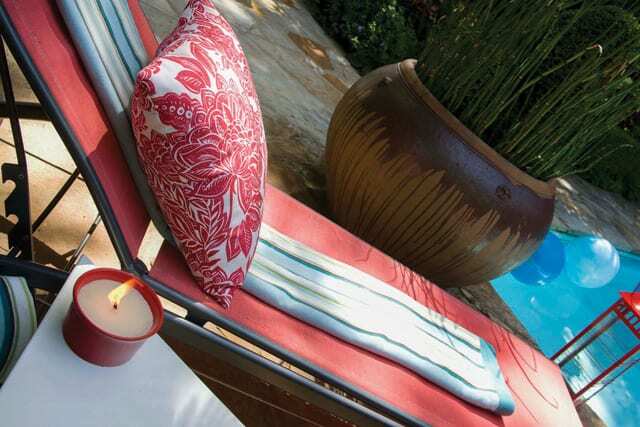 Dress up your pool area with towels you‘ve selected for this purpose, and provide ample seating. When I say ’seating,’ I don’t just mean chairs and chaises. 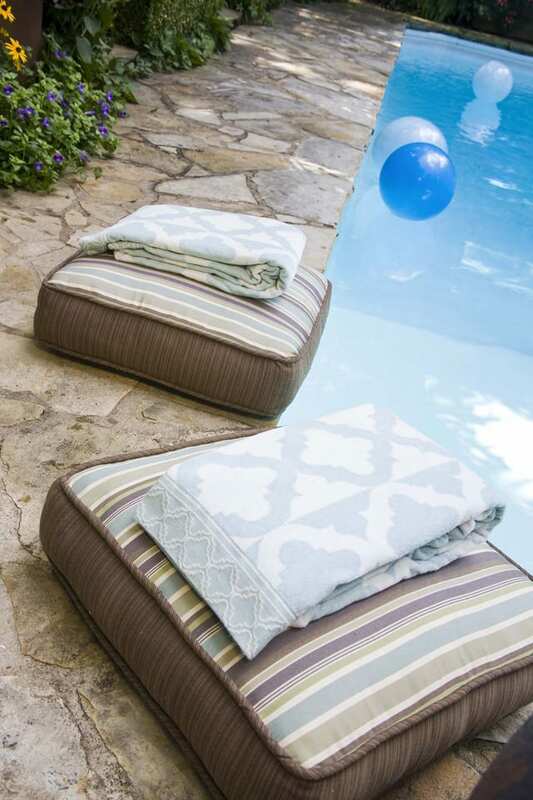 Drop pillows poolside and provide a towel for each. Your guests might want to dangle their legs in the pool and you’re giving them a way to do it. 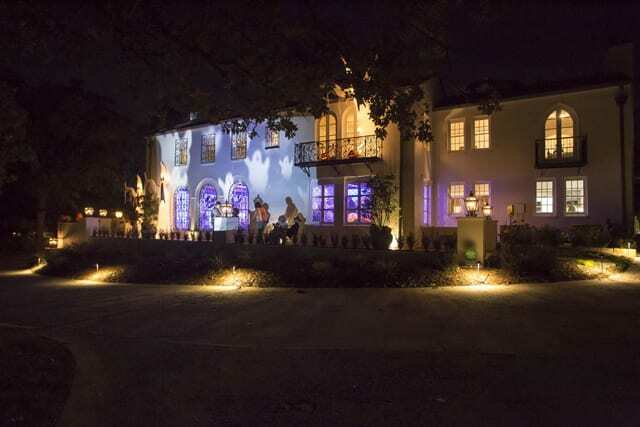 Even the most formal party will benefit from this touch. Your guests may not take advantage of your offer, but they’ll appreciate it just the same. Stack ’em up. 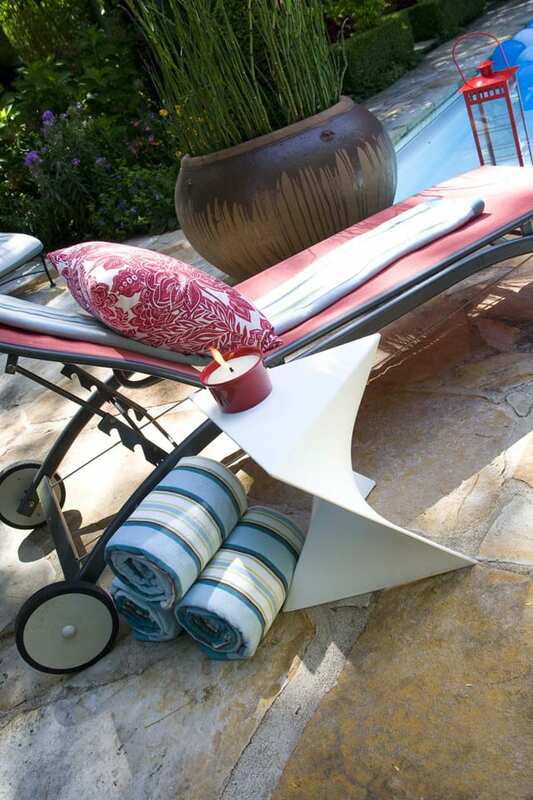 Move a chaise even nearer to the pool edge, then plunk down a towel and pillow. If a guest doesn’t want to sit directly on the concrete, he or she can still access water’s edge with this seating nearby. And pay attention to color, either contrasting or complementary. Fire and Water. After you’ve provided seating and towels to wick away moisture, don’t forget to add candles for a glow that will take you into twilight and dark. Scented or unscented will do, and to ward off mosquitoes, don’t forget the citronella. 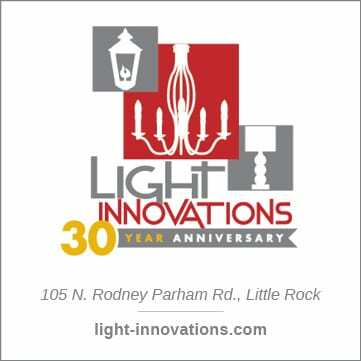 Exterior lighting can be abrupt or harsh, and candles go far to soften it. Bringing it together. This photo is deceptively simple, but it encompasses quite a bit. You’ll find the seating, towel, pillow, flickering candle, and finally a robust plant in a pot. You’ve set the stage for your guests to stay as long as they wish. Isn’t that what we all seek when you entertain? That our guests linger and enjoy the conversation and surroundings? It’s all in the details you provide, the staging you set. You’ll notice I didn’t state that everything must match, or that there are rules to follow for success. The towels should be selected for poolside use, but that’s the only requirement. 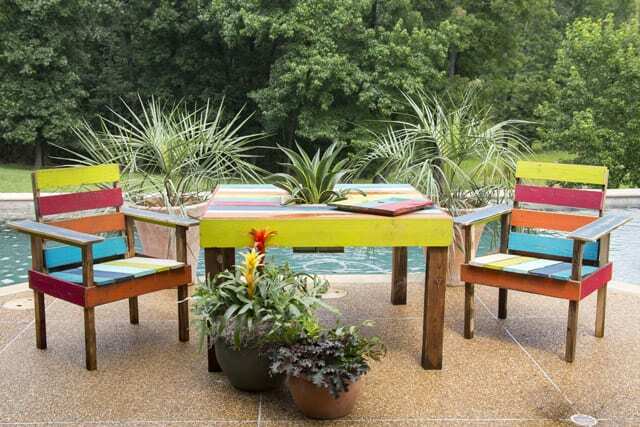 Maybe you want to mix it up with contrasting colors or pattern, or use the same color palette all the way around the pool. 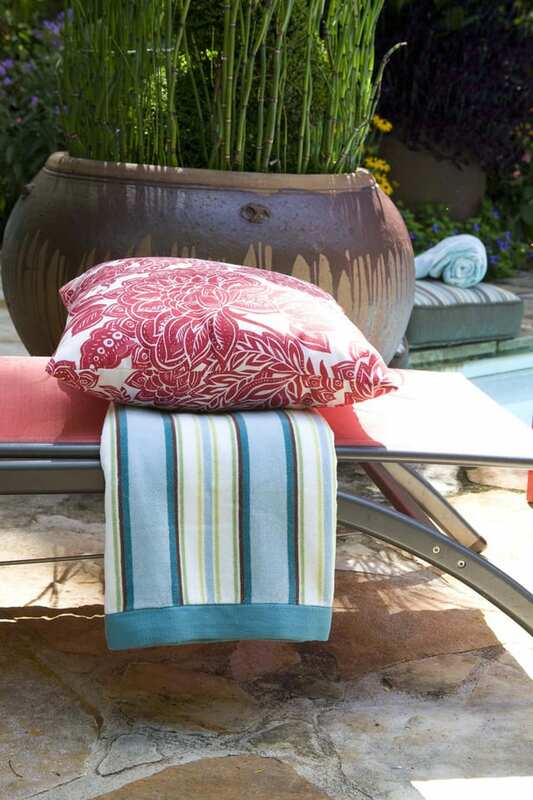 And the diverse selection of cushions and fabric made to use outdoors has skyrocketed, so you’ll find a wide selection to chose from anywhere you shop. Once you‘ve paid attention to each detail, when people arrive, they can relax and spontaneity will set in. 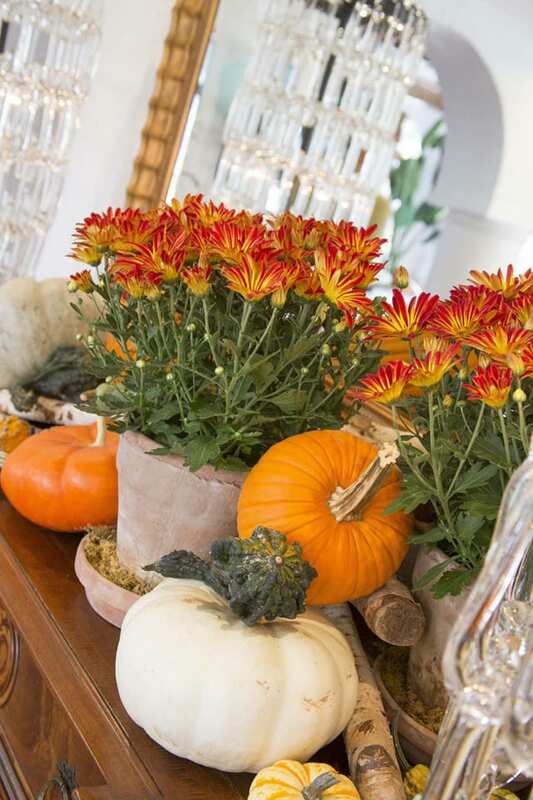 Not only is it in the mix of guests and entertaining elements, it’s also in your eye for detail. And all that means is taking a look around and anticipating what your friends and family–and you–will enjoy. 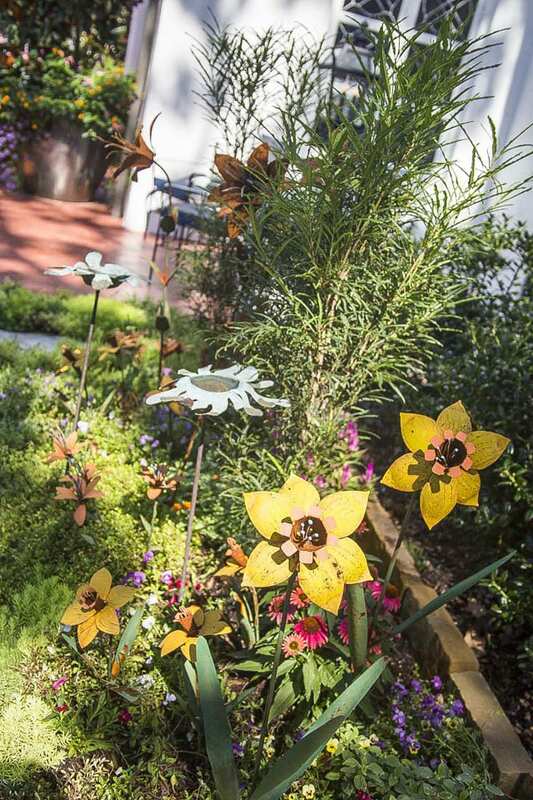 A great landscape design is not just about the plants, or color at specific times of the year. 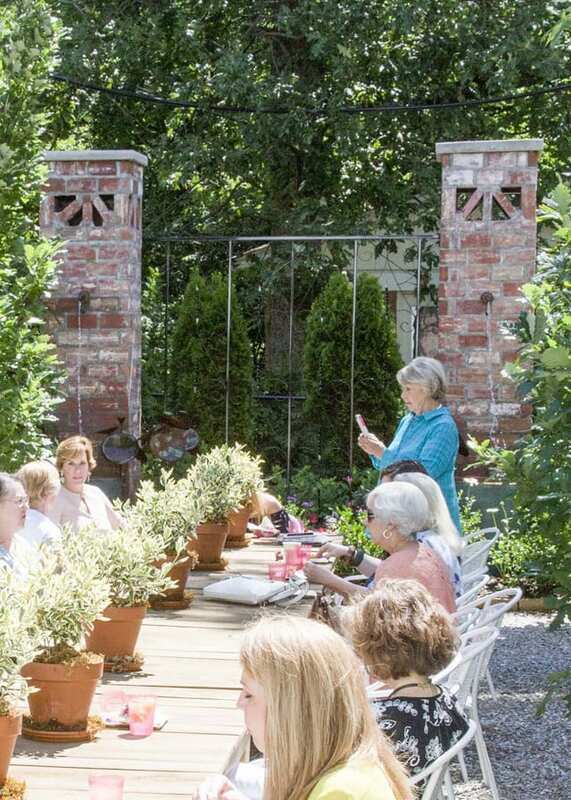 You’ve heard me say that before, but it bears repeating: In order to truly enjoy your outdoor spaces you need to provide points of interest and novelty, not just perennials and annuals, growing cheek by jowl. Further visual interest can be incorporated with rock and what’s known as ’hardscape,’ These additions can contrast perfectly with what’s growing. But how about adding another sensory element, such as sound? No, I’m not talking about a speaker system. What can work well can be a water feature, which adds much, much more to your visual design. 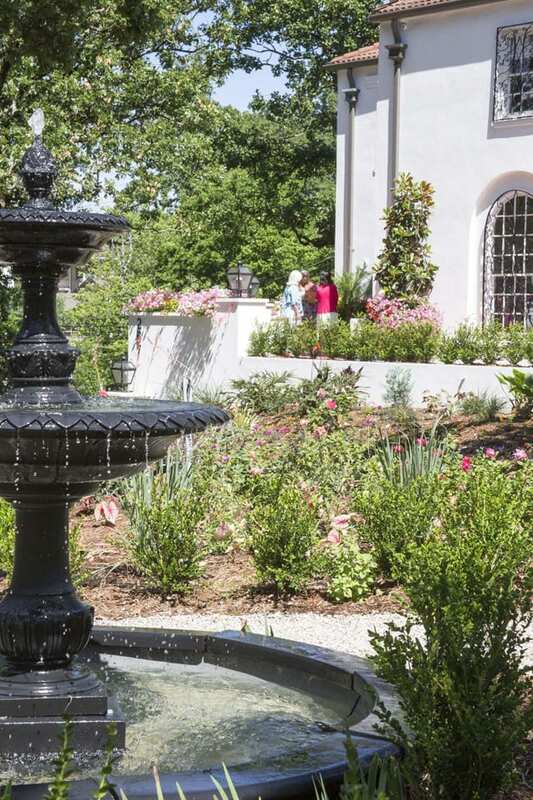 I’ll show you two distinct fountains that can add real pleasure to your outdoor spaces. This traditional fountain placed at a strategic point in the garden performs a great task; it serves as a destination and focal point. It has all that typical fountains provide, such as low maintenance, attraction for songbirds, and a style that is complementary to the house. Bust as you gaze at this photo, you know what’s also here: The calm and lovely sound of trickling water. That one sound makes a fountain, no matter its size, a point of interest to all. Something else cool about this one is that, no, it’s not made of cast iron. It’s concrete stained black. Talk about low cost and upkeep. And your foundation plantings and annual planted for seasonal color seem to almost lean into this water feature. 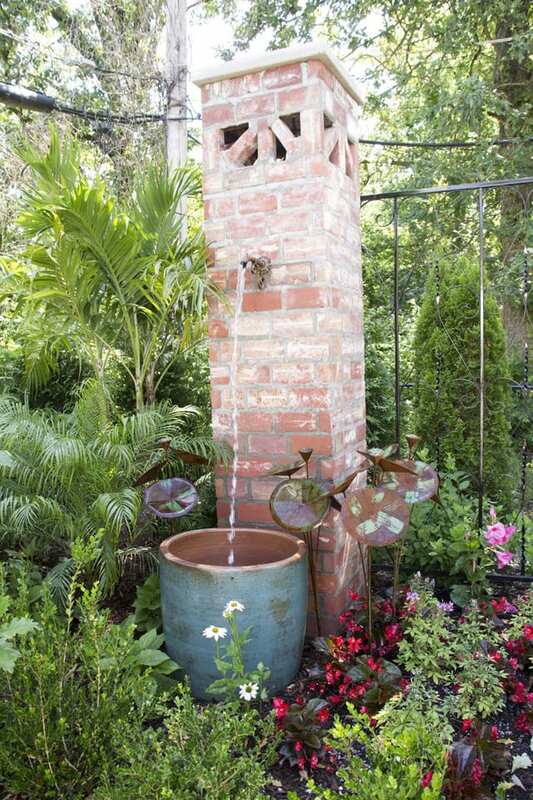 One of a pair, this fountain is fabricated from recycled brick, vintage waterspout, and glazed jars we offer at Botanica. I designed this pair to serve as a sort of boundary in the garden, and everything to build them was found and repurposed. I created an open top, and installed four LED uplights within. The fountains are also lit at night. I used vintage spouts and inserted the motor in each. You can just plug these water features in and walk away. What’s nice here is that they’re upright and not bulky, which means they won’t overpower the space and you’ll have plenty of room to nestle plants all around. 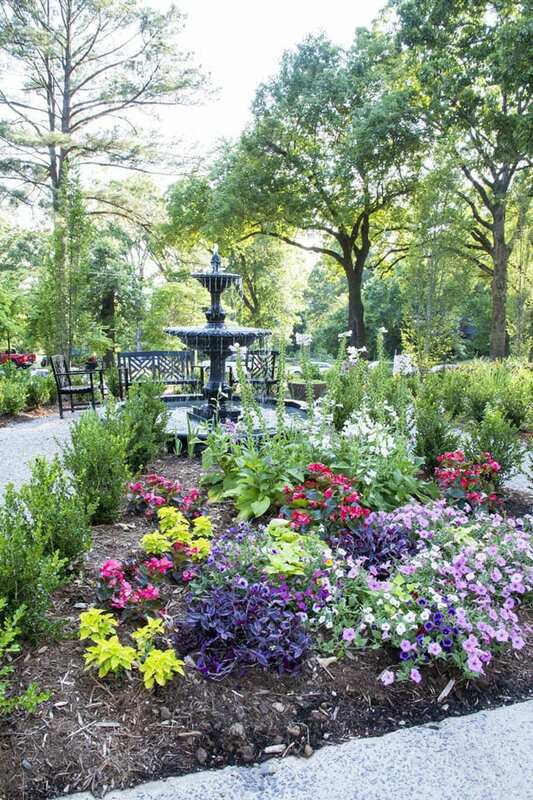 Fountains, by the way, don’t call for specific or traditional plantings only. A water feature will only bring out the best of your plant groupings, no matter the style or quantity. Remember this fountain is not cast iron, but concrete. You wouldn’t know that unless you studied it closely. It is a great addition to this garden, however, because it’s on another level and creates further dimension to the design. And, like I said before, the sound of the water–soothing and tranquil–will attract and delight your guests. Because this pair of fountains would be part of the garden boundary, I wanted to make sure the fence itself didn’t detract from them. And, in keeping with the recycle-reuse-repurpose philosophy I was mindful of while creating the fountains, I chose iron salvaged from an old carport on the property. The brick fountains pull the eye up, and aren’t hulking or massive, yet are also unexpected. These fountains have spouts that control the water flow, so what you get in the way of sound here is a ’burble,’ not a splash. Which means you can convene the book club nearby, and everyone can be heard. 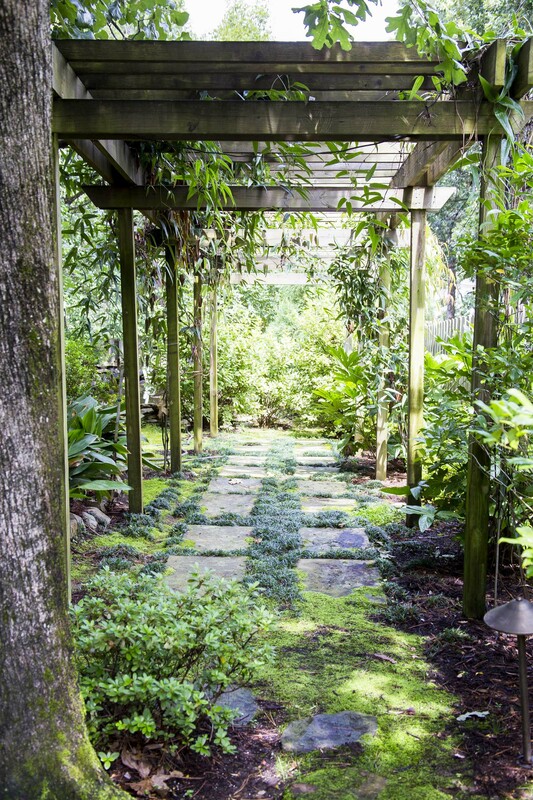 Garden design doesn’t have to be confined to elements that we can see only. Don’t forget your other senses when planning your space. And fountains don’t have to be expensive or large. You can find a fountain design–or design one yourself–that will fit any budget and any space. The sounds of water flowing up, over, and down as it follows gravity will delight you and your guests, no matter the season. When you think of the word ‘landscape,’ you think of plants, right? For any project, especially curbside or at the entrance of your property, you endeavor to create the right mix: trees for height, canopy, and anchor, shrubs for depth and dimension, select perennials, cheery annuals you change out seasonally. But what if instead of creating that massing of plant material at the center, the eye level of your design, you used large rock instead? And planted around it. One boulder–or two or three–can provide every bit as much interest as all those specimens and be a real focal point for your design. I didn’t create the landscape for this home, but I love the impact of natural stone incorporated here. The plants grow up, over, and around the rock, and there’s still room for seasonal interest. A mature landscape area often loses depth and scale because plants grow. That shrub you admired when you bought it can outgrow its allotted space in just a few seasons. The bloom cover you so love is now eight feet in the air, not three. Those beautiful glossy leaves now tend to turn their backside to you. Which means you have to pull it out and start over every few years. A rock won’t do that to you. It remains as reliable as the day you brought it in and rested it under the trees. And a large rock is also a good staging area. Does a certain vine attract you? Plant behind or alongside your rock and let it grow and scrabble over the top. And that froth of blooms you get annually is nice against the color. You can add a bit of middle ground height behind it, like these cannas, to give your design depth, and pull the eye up. Next to the boulder are grasses and daylilies, their lance-like foliage a contrast in growth form. Plus, they provide dependability, as do all perennials. They’re also hardy, which may be necessary; stone tends to radiate heat in thewarm months. 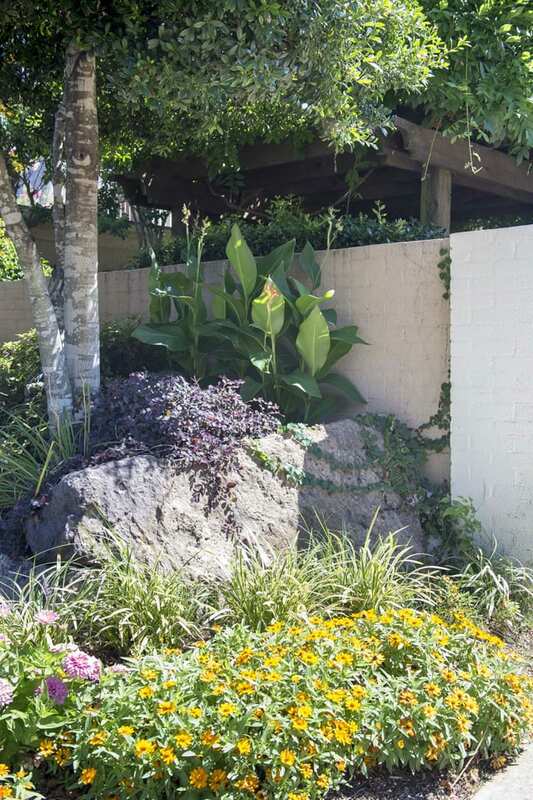 Once it’s all in place, you’ll perform a bit of maintenance on these plantings as they nestle in with the rock. 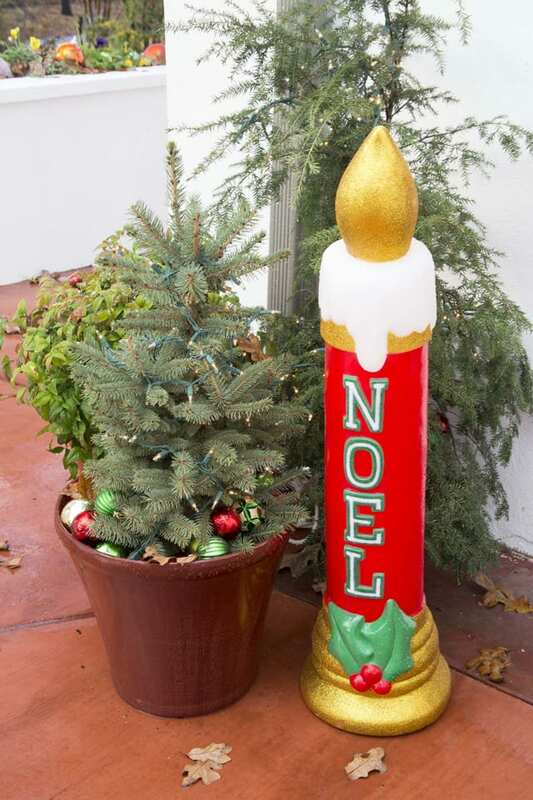 But you save your energy for seasonal plantings right up front. Annual color pops when it is featured with stone. And another good idea about combining rock with plants is that you can adjust the size of your design according to the space. 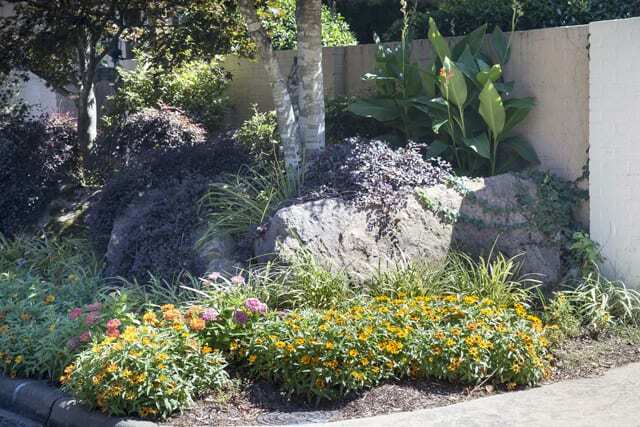 If you wish to use the same idea in a courtyard or create interest in a lackluster corner, just size down your rock accordingly, and use the same mix of (downsized) plants. You can have this combination in full sun or shade. Another good thing about stone in the landscape is that stone doesn’t have a list of requirements to grow. As always, I encourage you to think of new ideas for your landscape. Ideas that will give you pleasure and maybe a bit of a thrill when you turn in your drive. 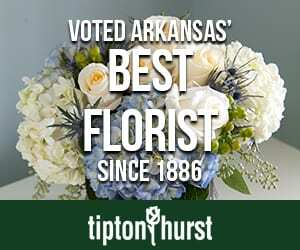 Natural rock can be as exciting as any plant recommended at the nursery. Just place it, use it as a complement to your favorite plants, then stand back and admire your work. And that chunk of granite or sandstone won’t get thirsty or overgrown or need maintenance. How nice is that? Reuse. Repurpose. Recycle. Reimagine. You know these words and their common use. We’re all serious about sustainability, because we should be. It’s a worthy pursuit and the subject of much discussion, but that’s just it. It’s sometimes a little too serious. I’ve always had a philosophy about elements of design, which I use in many, if not most, jobs: Use what you have, any way you can, and the result can be both fun and powerful. I call it Jhemajang. You pronounce it the way it looks; ‘hema-jang.’ As in, ‘Just jhemajang that [combination] together, and it’ll look great.’ It’s nothing more than repurposing something laying around, already bought, and maybe even still in use. You could go to your favorite source for outdoor furniture and plunk down a lot of money for serious seating, or you can do it like this. These pieces are from my custom line. Recycled treated wood cut and sized for any space. And check out the table and pots. You can create something in any size and configuration, then paint it all in thrilling combinations. Don’t try to treat these pieces with great dignity; treat them like the fun, unusual elements they are. And they’re easy to move around, even going indoors for extra seating at parties. 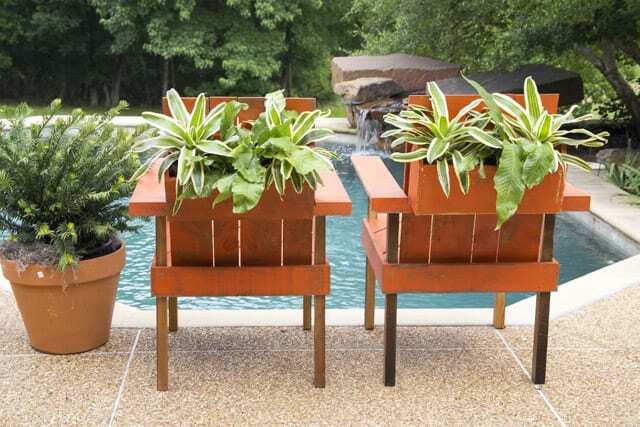 Since these pieces were designed to go poolside, we incorporated planter boxes on the backs of the chairs. Once again, custom sized, so you can drop in specimens you pick up at the nursery. Looks like they’ve been leading an enjoyable life, huh? How about carrying out that idea even further? 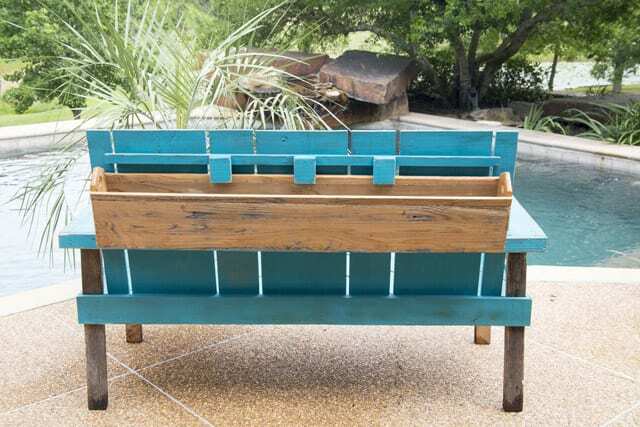 We attached an entire planter box—contrasting color, natch—to the back of this longer piece. 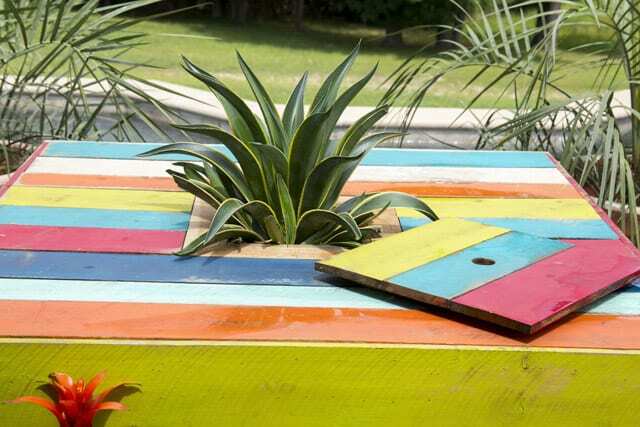 Because these are recycled boards, they’re light weight, so a planter box on the back is not a big deal, even full of plants. The seat can be moved with ease. And check out how the color pops when you do nothing more than place three different bromeliads in them. 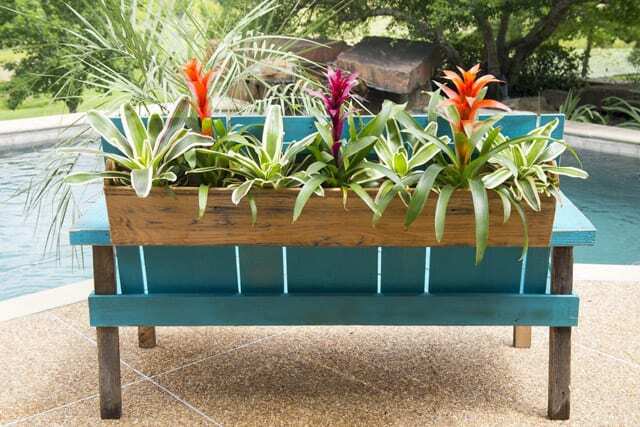 Not only does this furniture need little maintenance, bromeliads are real workhorses, too, that require very little care. Not only are these stripes pretty cool, the color combination is nice and cooling as well. 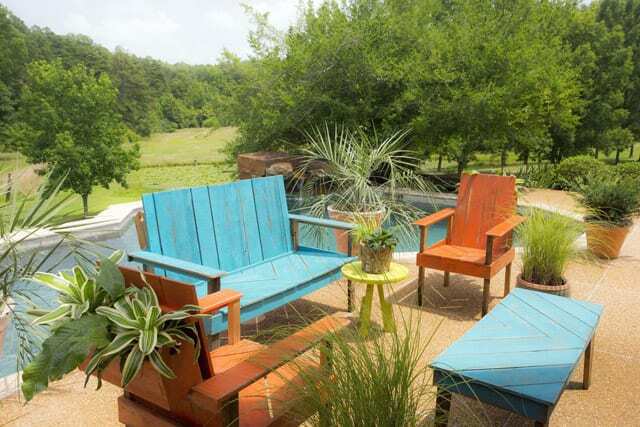 And all plants look good with bright, colorful pieces surrounding them. Another truism. Check out the nice square table. See how the plant in the center seems to be peeking at you? It is. Because we created a recessed pocket in the table center, in which it sits. If you don’t use the compartment for a plant, you could always use it for an ice bucket, or even to hold bottles or cans. When more table surface is needed, just put the lid over the pocket. Multi-functionality is another advantage these pieces have. If you’re not a fan of fan backs, you should be. Just stripe them up in contrasting colors and see how they pop. 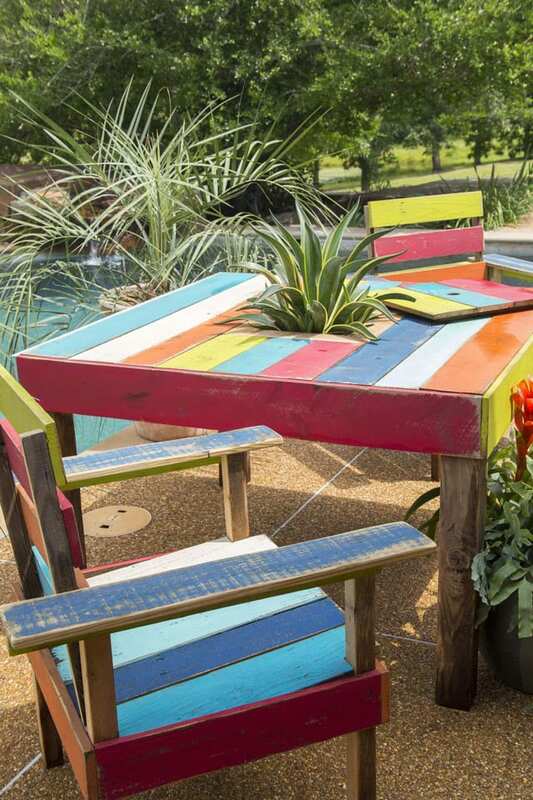 What’s so great about this recycled wood is that it can be used in many ways. 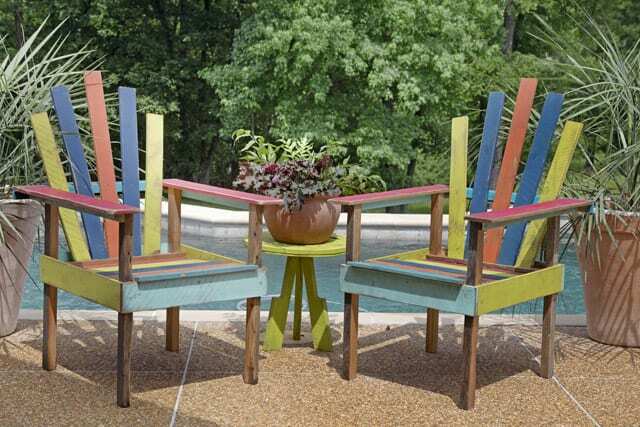 If you want to add pop to your patio—or any indoor room—these customized pieces will do the trick. Remember, landscape is not just about growing elements; it incorporates what makes you feel good, too. Don’t be afraid to be adventurous, and also remember to use what’s already available when you can. And create unexpected combinations, because that’s the Jhemajang way. We built these pieces with recycled treated wood simply because they’ll add life to any area. 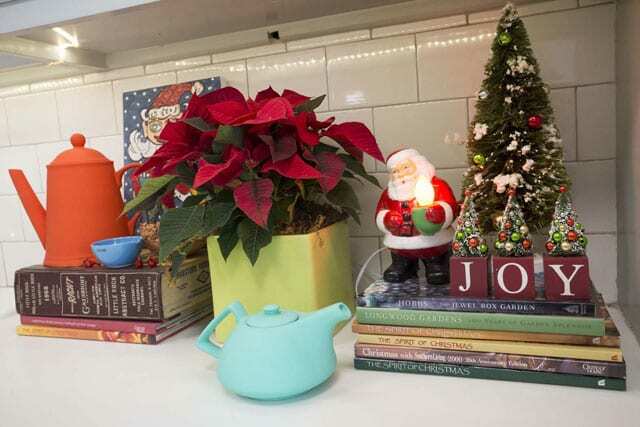 Create fun spaces, use unexpected color combinations, and, above all, enjoy what you have.